The church is bleeding fastest among its youth. If your church has seen decline in recent years, you likely know this to be true at the anecdotal level. But the research bears this out, too. 60% of Christians between 16-29 leave the church. 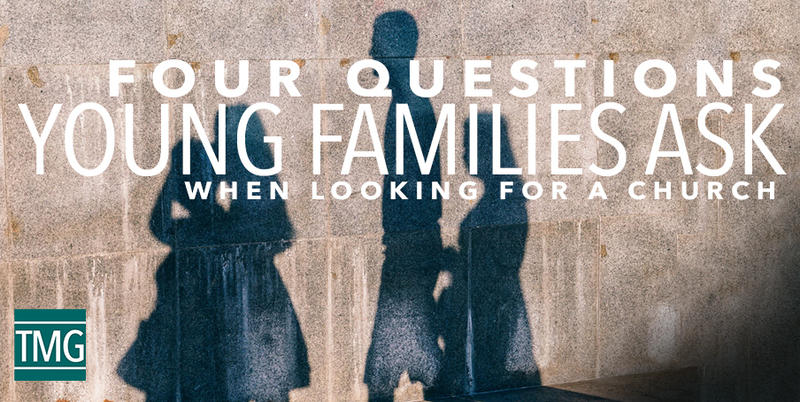 Nearly every church that The Malphurs Group partners with in a revitalization process is struggling to reach families in general and young families in particular. We are regularly asked, what do we need to “get younger” as a congregation? We will be addressing concrete steps and actions in our upcoming webinar, but before we can take action, we need to understand the mindset of many young families. Everyone is unique and visits a church with their own set of experiences, biases, questions, and assumptions. However, there are some consistent threads of thinking we can be mindful of. 1. Is this church for my kids? Earlier this year, my family took a quick trip through Washington, DC. We didn’t have time to go into every museum, but we did make time to visit the National Museum of American History. The whole museum is a lot of fun and really well done, but most of the exhibits aren’t exactly kid-friendly. My wife and I spent a lot of time saying, “Don’t touch that!” and “Hold my hand!” Except for two areas: the “Spark!Lab” and “Wonderplace.” These areas were just for kids. Do you know what expression I saw on parent’s faces in there? Relief. This was a safe place for kids to run, wiggle, jump. I didn’t have to worry about them ruining a priceless piece of history. I just had to make sure they didn’t lick a plastic apple and get a virus. When young families visit your church, they want to know if this is another place they need to make sure their kids don’t break anything. Is this a safe place for kids to be kids? Is your church more like a priceless exhibit or a kids museum? If your church decides to place a high value on reaching young families, you’ll have to place a high investment in making your church a place where kids can be kids. 2. Is this church for me? When parents drop off their kids and make their way back to the worship center, do they feel like the church is for them? The emphasis is on the word “for.” This is not a question of style or preference, necessarily. It’s a question about whether or not a guest feels like the congregation actually wants this new family to be there. A few years ago, my wife and I were looking for a new church. I had left being on staff at a church, and it was time for us to find a new church home. We visited several places. We didn’t pay too much attention to music style, though we had our preferences, but we couldn’t find a place that seemed right. Eventually, we were invited by a friend to visit a church that we never would have considered. It was a different denomination than we had ever been a part of before. What we quickly realized was that this church loved us, showed us grace, and lived out the gospel. On all of the important theological points, we had agreement. Most importantly though, they not only preached Jesus but acted like Him, too. We knew that we were loved. So we stayed. When a guest comes to your church, will they feel like they’re being merely tolerated or like you want them there? The sad truth is that most churches are built for the insider, and it can be incredibly difficult to “break in” to what feels like the “inner circle.” Unfortunately, no matter how great your children’s ministry is, young families will not stick around unless the parents feel loved and welcomed. 3. Can I relate to the other families at this church? Parent shaming is a real thing. In a world where social media dominates, and every post on Instagram seems filtered and designed to make our lives look great (while ignoring life’s pain), most parents don’t want one more place to feel like they’re less-than. When new families visit their church, are they going to feel like they need to put on a fake Sunday smile, or can they be themselves? Will single parents feel shamed because of their divorce? Will inter-racial couples get sideways glances? Do families need to be dressed to the nines, or is it okay that five-year-old Suzie wouldn’t walk out the door without her Minnie Mouse shirt and blue tutu? Is your church for perfect people only? Or can people truly come as they are? 4. Will my kids want to come back? I hear you. I do. And these objections are completely valid if we were talking about spiritually mature parents. There are Sundays when I have to drag my kids to church because it’s important, even though we have a great children’s ministry! However, you cannot expect spiritually immature parents to tune out their children’s cries not to go back to your church. Church isn’t a priority to them. Therefore, we must make every effort to create compelling environments for kids. Why should we cater to them? Because their souls are at stake! If Jesus was willing to give up His life for us, surely we can invest our time, talent, and treasure to reach families with the gospel. God is calling your congregation to have a generational legacy! In this webinar, you will learn how your church can begin to attract and retain young families in your community. I will not be able to attend webinar but very interested in the information that will be shared. Will this be made available at a later date or will the session be archived for future viewing? Yes! We will email out a link to our whole email list. Be sure you’re receiving our email updates. Thanks!